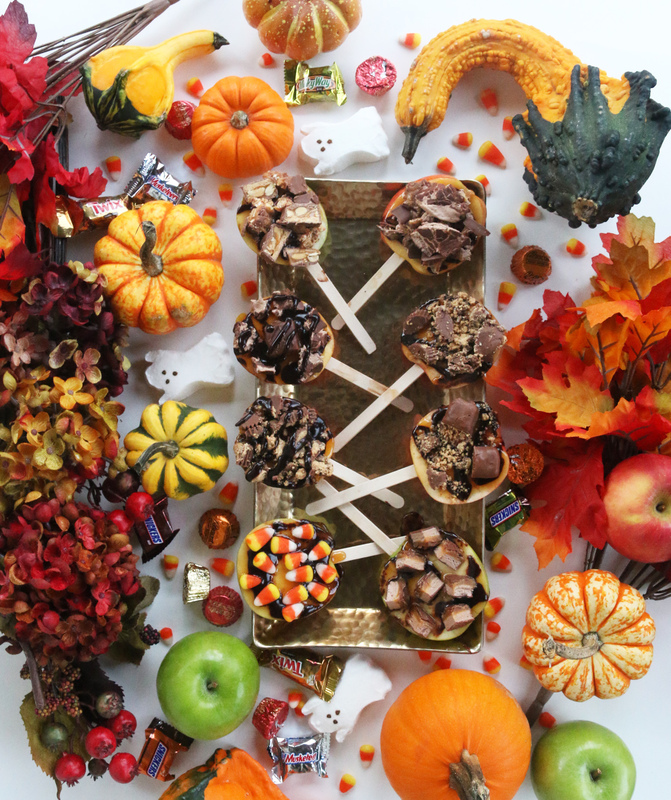 No fall season is complete without a fun, edible DIY project! 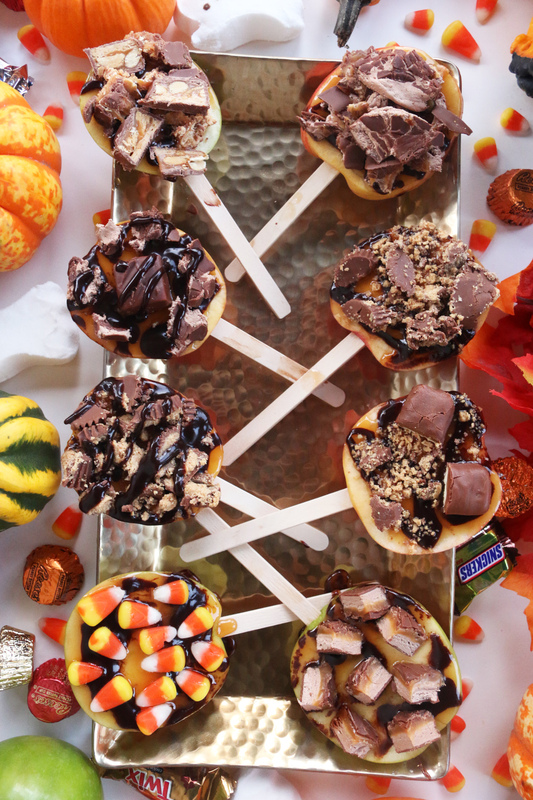 I wanted to share my recipe for the quickest and easiest treats during this Halloween season – candy apple pops. This is the perfect treat for a date night with your loved one, fun with the family, or for hosting a Halloween party. Seriously, this project takes about 30 minutes total and will wield you with the yummiest treats of the season. Not to mention everyone will think you’re a master chef. I had a fun time making these with my fiancé, Scott, who just got back from a training cycle in Louisiana. We were supposed to make them last night but he ate all of the candy corn and Reese’s. Honestly I can’t blame him because if I was stuck in the woods eating MRE’s (google it, I dare you) I would go HAM on some candy too! Below I have listed out what you need for this project and a step-by-step process on how to make these. I’d love to see you mix and match ingredients for your family! For example, you can try using gummy worms or Oreos! A variety of candy – I bought Candy Corn, Twix, 3 Musketeers, Milky Ways, Snickers and Reese’s. Cut apples into slices, about 1/2 inch thick. Take the sharp knife and at the bottom of the apple make a small incision where you will stick the popsicle sticks. 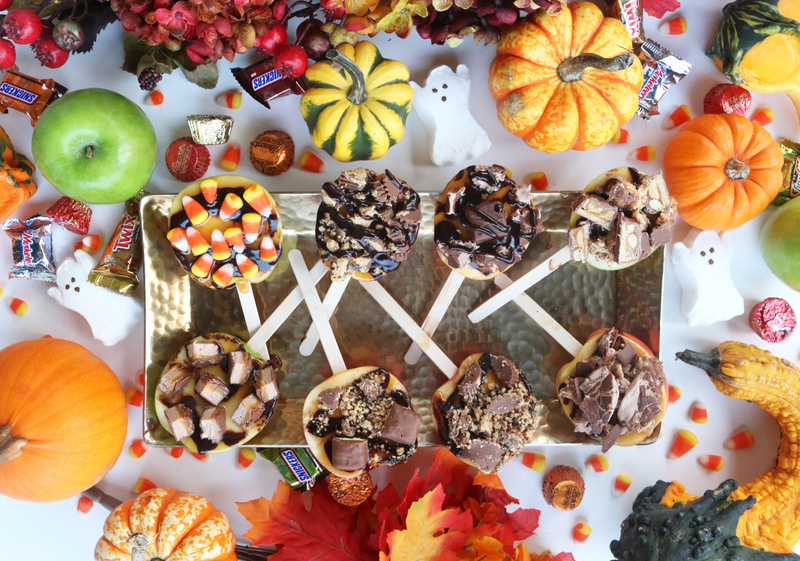 Put popsicle sticks in each apple. Lay apples out on a cutting board neatly. Carefully drizzle caramel over the apples. 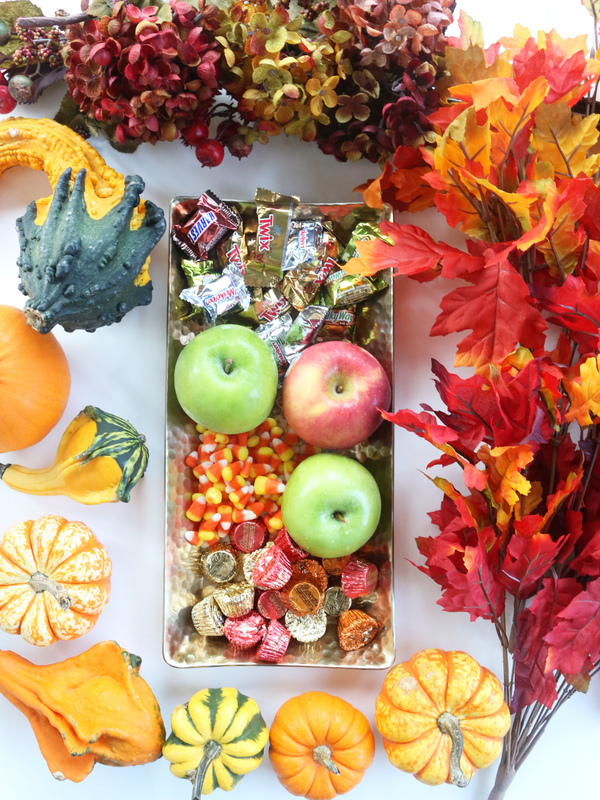 Take a small bowl to smash the candy (not candy corn) into pieces. 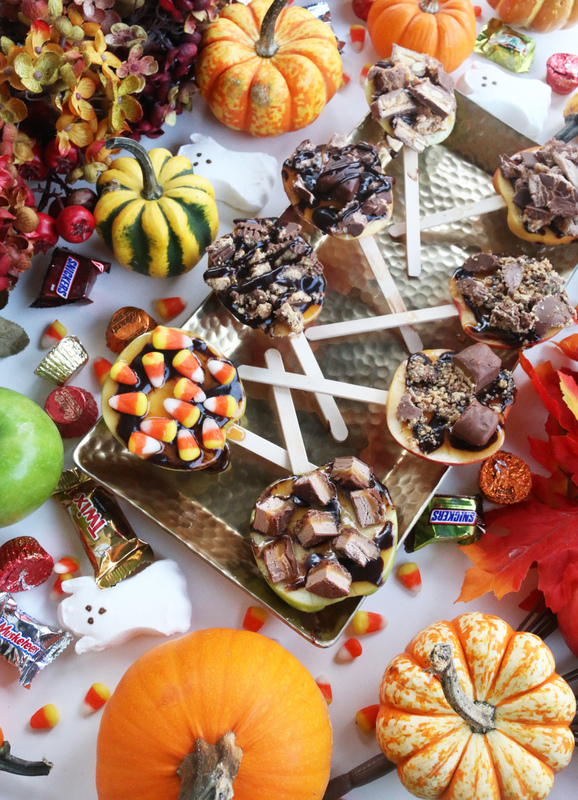 I suggest doing it brand by brand, making a Twix apple, Milky Way apple, etc. 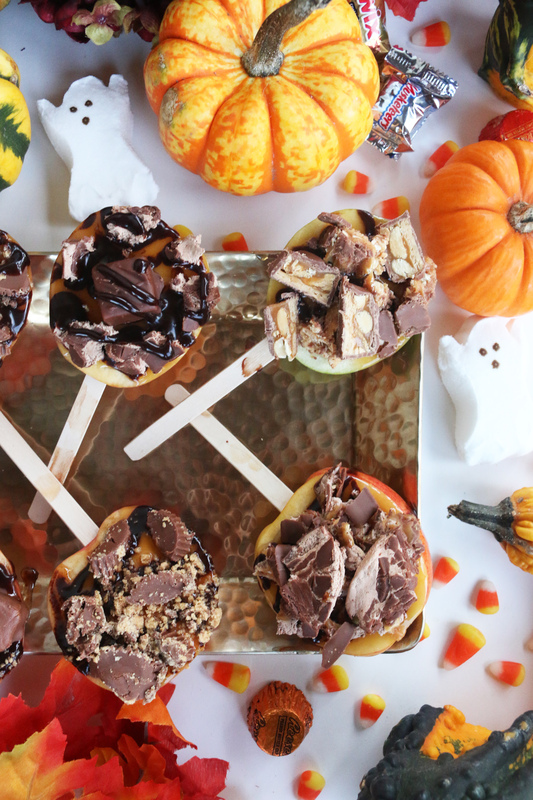 Sprinkle smashed candy on to the apples and load them with additional bars of candy. Stick the apples (still on cutting board) in the freezer or refrigerator for about 15 minutes so the caramel and chocolate harden. These are so cute! The look delicious too. I know my kids would love to make these. 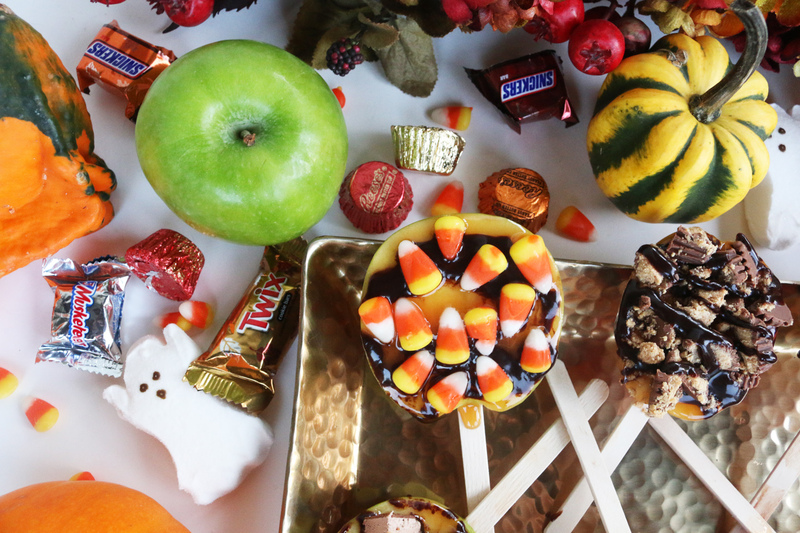 A perfect fall treat. Wow these look amazing! I might have to make a few of my own this year! Thanks for sharing girl! I was really happy with how the pictures turned out, I went a little above and beyond with the flatlay ahah! These look so amazing!! How creative?! I want to try this with the apples we just got! Those look SO delicious! What a beautiful post! Oh my how fun!! I think I’ll have to try to make these for next weekend! Yes, yes, yes! You need to! These look so yummy! And such a fun activity. Pretty sure if I tried to make them that they would not turn out as beautiful as yours! My fiance made two of them pictured above – if he can make them look good anyone can, hahaha!!! Okay, I’m so making these!! I am obsessed with candy apples!! We buy them every Time that we see them at a candy shop. Thanksss for inspiring me to make my own!! These look so yummy! Definitely trying these babies out! love it! You’re welcome Anna 🙂 Thanks for your sweet comment! This looks amazing! I’m going to try it this weekend and bring it to the office next week! You coworkers will love you forever, haha! Oh my gosh, these look so amazing! I need to try! Yes you do! So yummy! So fun!! I never thought about dipping them in crushed candy! Definitely going to try this with my toddler! Isn’t it the perfect idea? And you can use whatever candy or cookies you like. YUM! This makes me want Halloween candy right now!! These look amazing! I can’t believe you made these! I need the crafty and cooking gene. These look Amazing!! And totally doable ???????? My kids would be in HEAVEN!!! HOLLLYYYYYYYYY!!!!!!! This is amazing – thanks for the recipes! I definitely need to try this! Donna you NEED to make these. They are SO GOOD!! My daughter would have so much fun making these! So yummy! Me too!! Candy corn is my favorite. My coworkers said they hate it.. blasphemy! 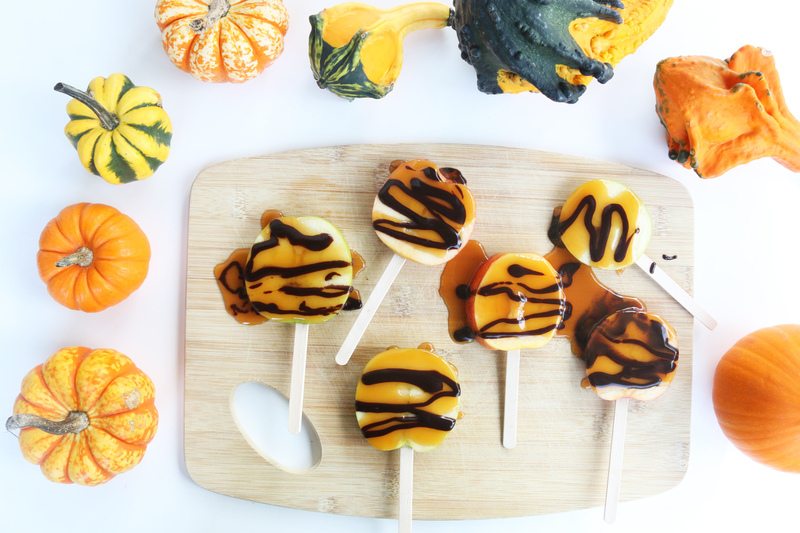 These are perfect for a Halloween party! I need to try all of these! Especially the snickers! How fun are these! I bet they tasted delicious! Omg! my mouth is watering! These looks so good! And they don’t look too hard to make which is a plus for me. I’m not the best at complicated cooking instructions lol. Thanks for sharing! Wow these look soooo good!! Thanks for sharing such a pleasant recipe! How nice is it to have Scott back with you? !